Punica granatum nana from TimeLapsus on Vimeo. The first two pots contain the pomegranates, the one in the back is myrtle. Six out of 31 seeds have germinated. I do hope that I can get at least three to become saplings. I have just felled the three in the front pot and hope they will survive that. Their roots went down to the bottom of the pot and I might have hurt them. 24 days ago, I had sown pomegranate, myrtle and olive seeds. The pomegranate and myrtle seeds have started to germinate according to the description which came with them, actually a bit earlier. So far, I got six pomegranate germlings from 31 seeds and as of today seven germlings from 32 myrtle seeds. The olive seeds are not to germinate for at least another week. I had hoped for higher numbers, especially with the pomegranate seeds, but if I can actually get six saplings from those little fellows, that would already be great. Also, there are still some days left until the “official germination period” for both species ends. As I wrote in my wishlist, I want to grow bonsai lemon trees, preferably of the Sorrento lemon. However, as they only grow around Sorrento in Italy, they’re hard to come by, so I decided to try and germinate common lemons first. I “found” one lemon in the office kitchen, squeezed it and made myself a nice hot lemon – ginger – honey drink and put the seeds into water until work was finished. 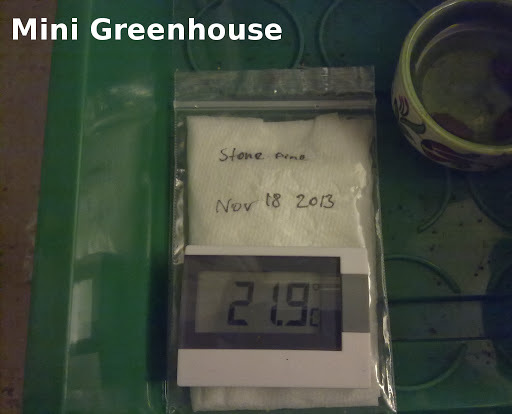 Then returned home, I put them into soil and into the mini greenhouse (which is now full, because the webcam and the thermometer needs space). Only after I had sown those six seeds, I read up in detail about how to grow lemon trees from seeds. I had read that it is important to wash any remains of fruit sugar (fructose) off them, but they are slippery and always slipped from my hands. So I went to the organic supermarket and got myself a lemon and a lime. They also had quince, which is on my list as well, but they were from Austria and I only wanted Mediterranean seeds. The lemon and lime both were from Spain. Olé! Back at home, I did as the lady from the other blog suggested. The organically grown lemon had many more seeds than the one I had taken from the office. About three times as many! The lime didn’t have any, though. I guess, it’s because it is a hybrid or something. I haven’t read up about that. I put the seeds about 1 cm deep into the soil and watered the pot plenty. 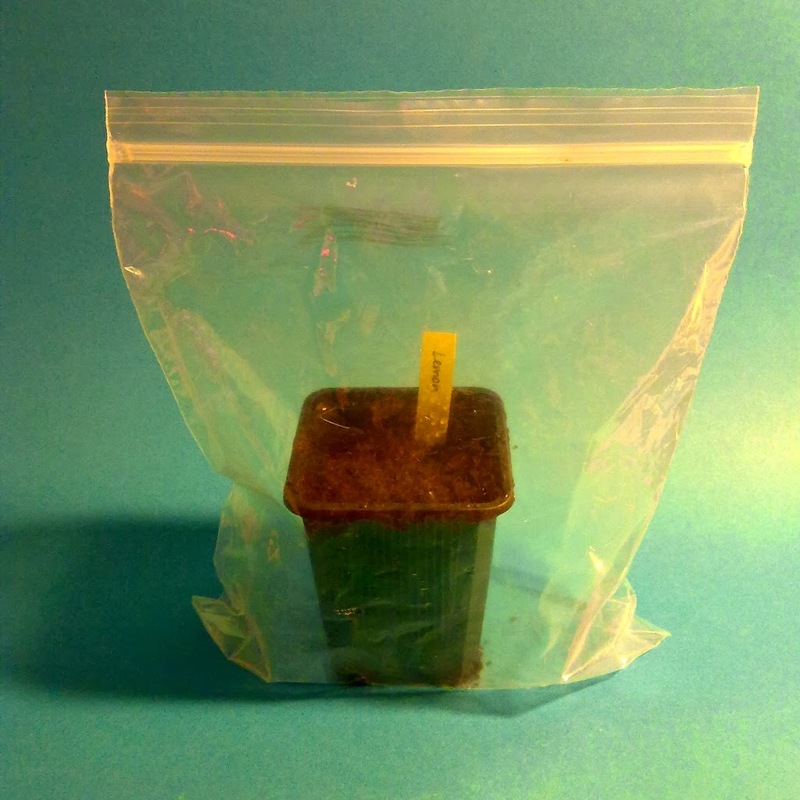 As the mini green house is full already, I decided to go for zip lock bags, three of them. I read that suggestion on yet another website. That one also said that it takes lemon seeds about 10 to 14 days to germinate. By the way, I’ve created an excel table for all my seeds, where I enter name of species, date of sowing, expected germination date and actual germination date(s). Otherwise, I would have lost track of that already. This morning, I came across the book Seed Germination Theory and Practice by Norman C. Deno (available as pdf here). As I have only discovered it this morning, I have not read it entirely and I doubt that I will, because he seems to deal mainly with flower seeds, but he only uses the Latin names. There is kind of a summary on this page, though, which again I haven’t read in its entirety, I have to admit. Anyway, the main points I took from browsing both website and pdf is that Norman C. Deno and Brent Walston both don’t believe in stratification to be the solution for all seeds. I liked that idea, firstly because they question all the stuff that is posted and reposted again and again and secondly, because I don’t want to wait for my seeds to rest in the fridge for weeks and months. 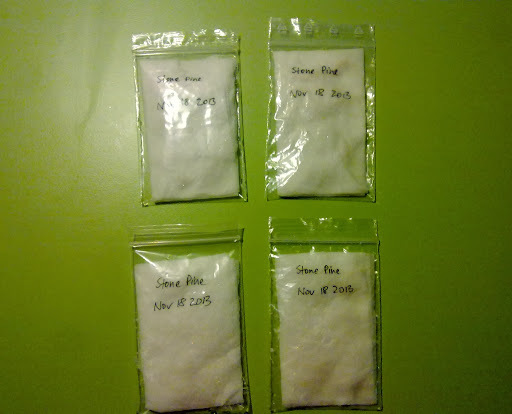 As Norman C. Deno apparently “only” tested flower seeds (but thousands of them, mind you) and I want answers for tree seeds, I decided to start my own little “science project”. I put it in quotes, because with the small data I can collect it’ll probably not be very scientific. Anyway, he proposed a method to test several ways to get seeds to germinate which I have tried to reproduce. On page 13 of his book (page 19 in the pdf), he explains how to do it and I mainly copied his method. I used 60 pine nuts – bought in the supermarket where they were sold for consumption, but I won’t get pine nuts easily anywhere else. 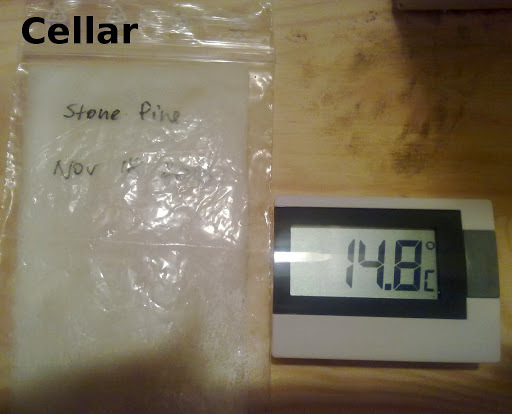 I also needed some paper towel of high wet strength (the one I bought isn’t very strong, but it’s the best I could get), polyethylene bags (I have loads of those, not because I smoke weed, but because the LEGO I buy used comes in them) that can be sealed, a waterproof pen, a plant atomizer and maybe scissors. 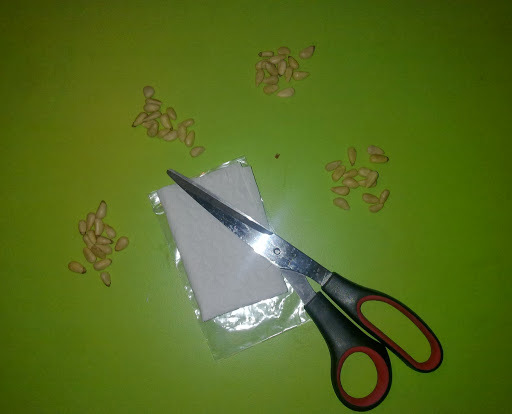 I made four batches of 15 pine nuts, folded each paper towel three times and cut them in a way they would fit into my plastic bags. If you have large enough bags, you might not need to cut the towels. 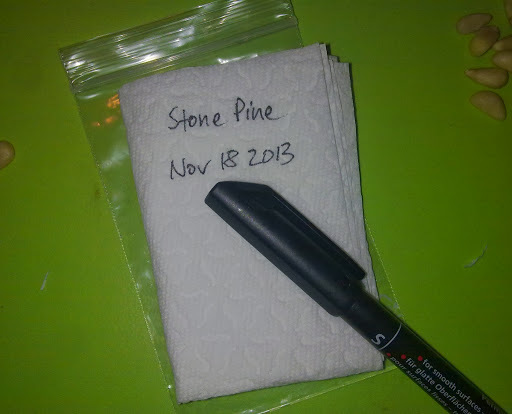 Then you write the name of the plant you got the seeds from and date on the “front page” of the towel. 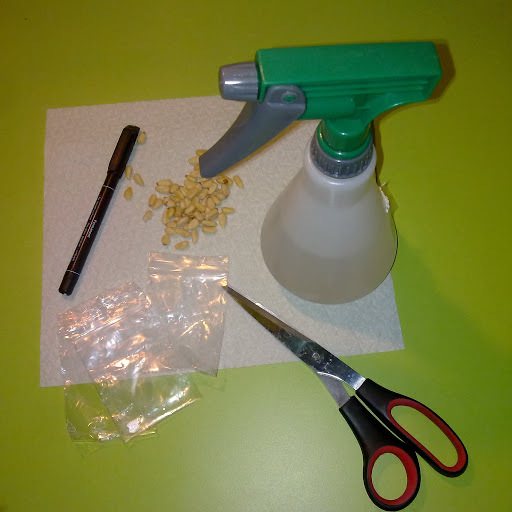 Then you open the last fold of the towel, moisten it with the help of the plant atomizer, put your 15 (or whatever number) seeds onto the wet part, maybe moisten it again a bit and close it. Then you put your package into the polyethylene bag and close it, but not entirely, so that some air circulation is possible and “to insure aerobic conditions”, as Deno puts it. 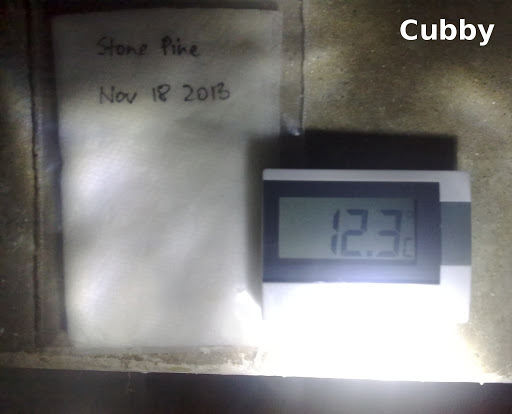 I put one bag in the fridge (stratification test), one into the mini greenhouse, one in the cubby and one in the cellar, which probably has a similar temperature to the cubby but less light. I should’ve found some place with temperatures below 4°C, but I didn’t know where. The freezer? Should be more like 0°C or less. Deno recommends certain brands of paper towel, polyethylene bags and even waterproof marker. The most important point to me seems his concern with the plastic bags. He says to use bags with very thin “walls” to ensure permeability of oxygen. I only had those, so I hope they will work. Now, I have to wait. I do hope that at least some of them will germinate, but I don’t know for how long they have been in the bag they were sold in…and if that’s bad for their ability to germinate. 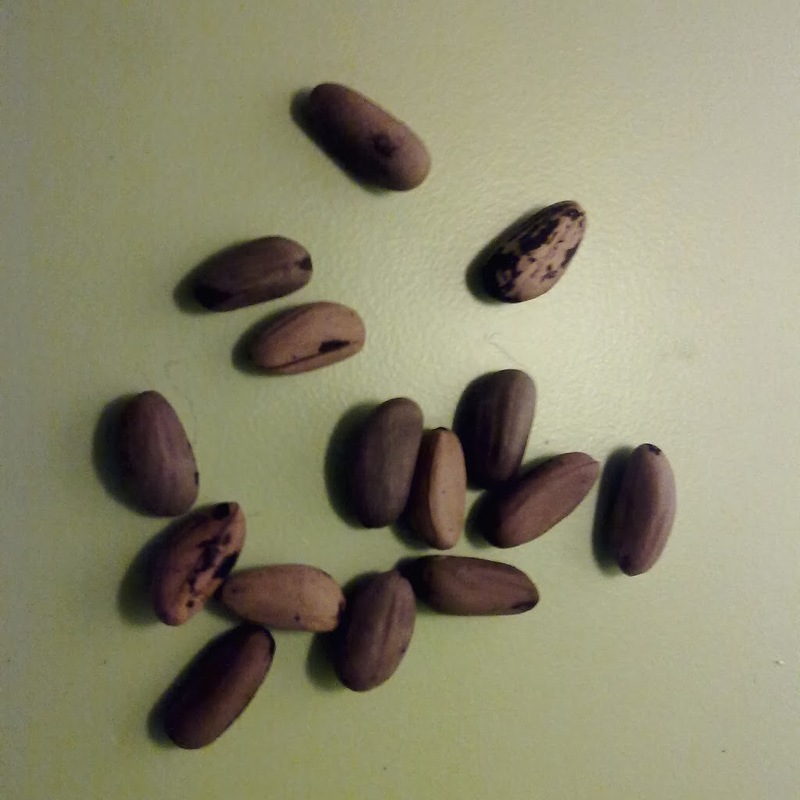 Drying seeds does not have to have a negative effect on them, as Norman C. Deno points out and is even necessary for some of them. I mean, obviously, otherwise stores couldn’t sell seeds. It’s just important to know which can handle it and which can’t. Room for another experiment. I might try apple pips next time. They’re more easily and cheaper available and I can eat the fruit. Maybe it’s an idea for a kid’s science project, too. It might wanna use a species that germinates quicker like beans or something, though. … would be my goal. But in an ancient design way. Some days ago, I had taken the temperature in the greenhouse every 10 mins for several hours and shared the ups and downs with my readers. 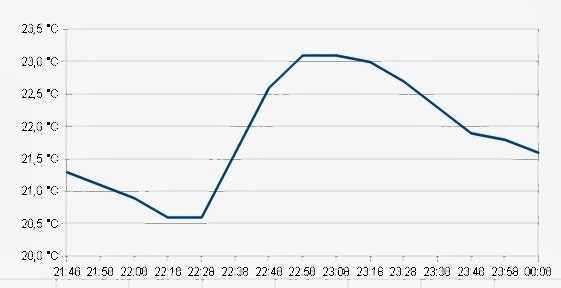 I have since taken the temperature again and again, not always noting it down, but being a bit concerned about it dropping below 19°C, when the ideal temperature for the olives and myrtle is between 22 and 25 °C. Apparently, the fluctuating temperature didn’t bother the pomegranate seeds, as three have now germinated. 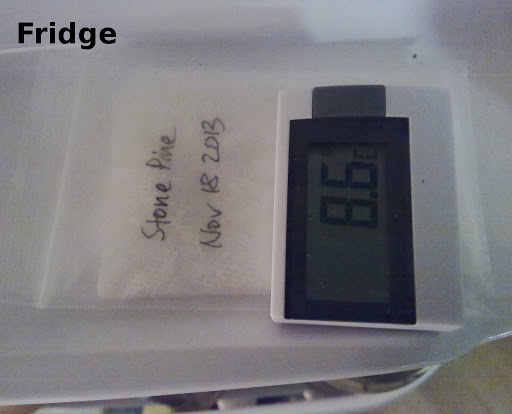 However, I researched online for a rather cheap way to keep a constant temperature according to the preferred ones by the seeds. 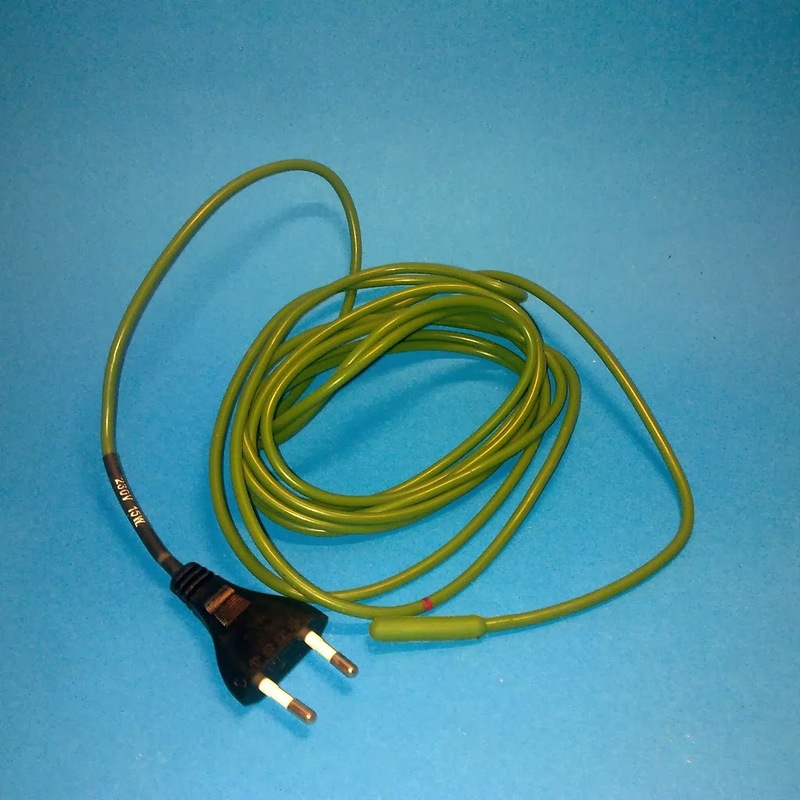 I found a heating cable by Romberg on Ebay for about 13 €. 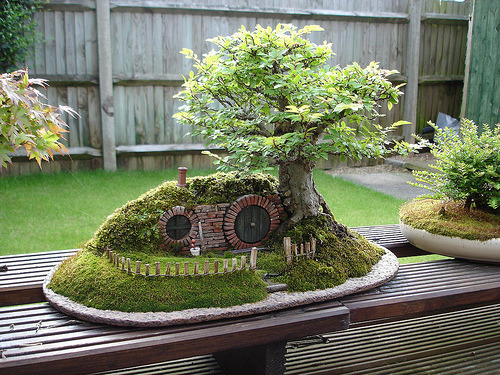 It is supposed to be laid out in the soil. However, as I have several pots in the mini greenhouse rather, that wasn’t possible. 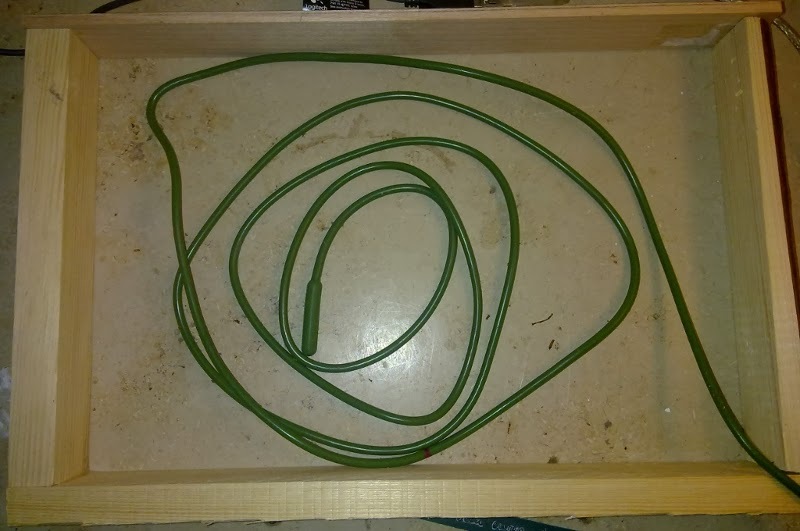 So I laid it out beneath, but with some distance between the cable and the greenhouse. I had built a wooden frame for the greenhouse to stand on, because the window sill got rather warm and by standing on the wooden frame, it wouldn’t come into contact with the window sill. They actually offer a heating mat for direct contact, but that was more expensive. I think it becomes quite clear that the temperature today was much more stable and ideal. I’m glad I bought it and that I won’t have to leave the heating on all day when I’m at work. The pine cone has completely opened and revealed several pine nuts. I collected 15 of them and will try to get them to germinate. However, I’m not very confident so far, because I have opened two others and there was only dust inside. Also, I read somewhere that floating seeds won’t germinate and all the pine nuts float. If they haven’t germinated after three weeks, I will just buy pine nuts and try them. Or collect more from the pine cone and open them before I put them into water. 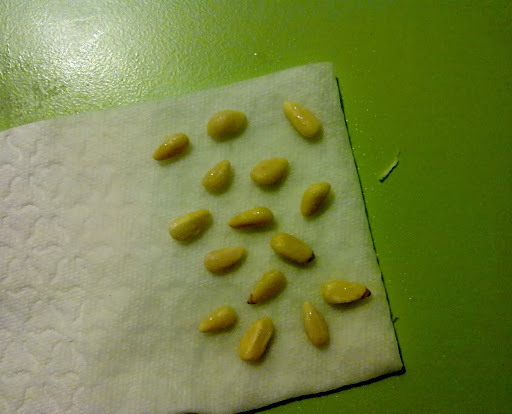 I have noted the date I put them into water, so I can determine the germination period for pine nuts.